This is the season to think about roses—but before you bring out the sprayers and start cursing blackspot, consider planting a species rose instead. Roses are fascinating creatures with a long history, much of it consisting of hybridization by man. However, in the beginning there were the species roses, those roses that arose on their own. No one knows how many species roses exist, with estimates running from as low as 50 to as high as 250. Originating only in the northern hemisphere, species roses ranged from North America to Europe to Asia. The majority bloomed only once during the growing season, producing blooms that consisted of five petals. Several of these species roses originated in the American South, including Rosa Carolina, R. palustris, and R. setigera; conversely, the Cherokee rose, the state rose of Georgia, is actually Chinese in origin. There are two species roses that I think should be in more of our gardens: R. Roxburgii, the chestnut rose, and R. banksiae, the Lady Banks rose. When I encountered my first chestnut rose at Montrose in Hillsborough, it knocked me out with its two supporting canes 10 inches in diameter and its height of 15 feet. Even when it’s not in bloom, this is a rose that will demand attention in the garden. Plant R. Roxburgii in a site that has sun, well-draining soil, and room to grow. This is a rose that is virtually impervious to blackspot so it requires no spraying and I don’t even bother to fertilize it. Its bloom time is in the spring but it will throw off a bloom here and there throughout the growing season. Unlike other species roses, the bloom is multi-petaled with only a slight whiff of scent. Called the chestnut rose, this rose bears interesting hips that resemble chestnuts. In the late winter I prune out the weaker canes, leaving the stronger ones for support. My chestnut rose is now eight feet high with five supporting canes. Gradually—because this rose resents severe pruning—I will whittle the number down to three canes. The largest rose in the world is the Lady Banks rose in Tombstone, AZ, covering an 8500 square foot arbor; the trunk cane is twelve inches in diameter. 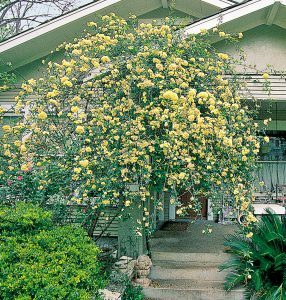 While it would be hard to emulate the Tombstone rose in our gardens, we certainly have room for a climbing rose that’s easy to grow, requires no spraying, and—reputedly—deer will leave alone. The yellow Lady Banks rose, R. banksiae lutea, supposedly is a bit stronger than the white, T. banksiae banksiae—however, the Tombstone rose is white, demonstrating a lot of vigor in the white. 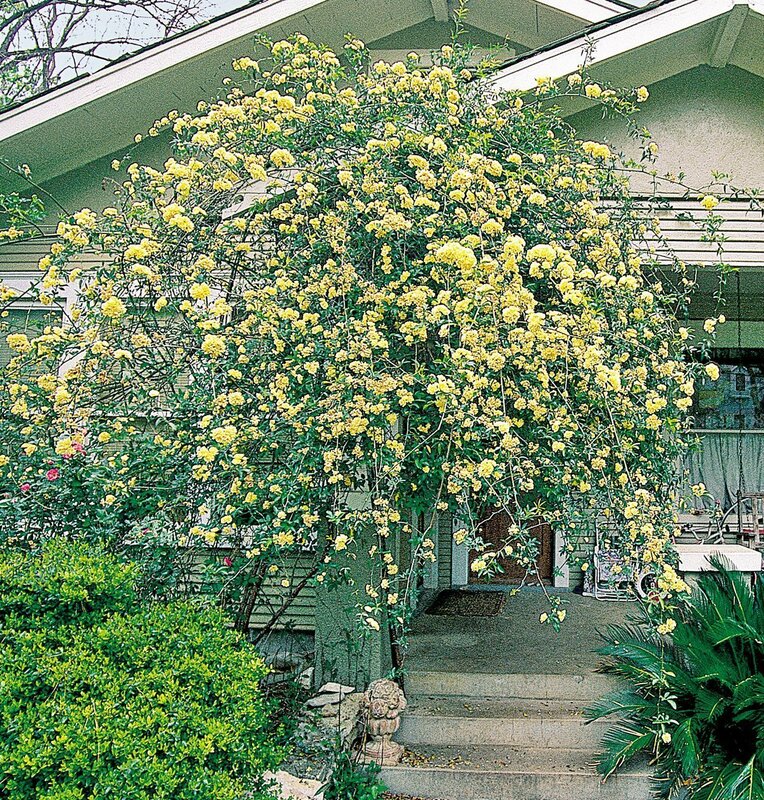 There are two things to know about the Lady Banks rose: technically it’s a zone 8 rose so plant it in the spring, not the fall, and prune it after it has bloomed. There is no repeat bloom cycle. One species rose to avoid is R. multiflora. Imported from Japan in the 19th century, Congress mandated its use in the 1930s to fight soil erosion and to provide quick fences for livestock. It quickly forms an impenetrable mess, is very difficult to remove, is excessively thorny, and is very susceptible to rose rosette disease. The small, white blooms offer little garden interest; it is really difficult to find a nice thing to say about this species rose. R. Roxburgii and the Lady Banks rose are readily available. Should you plant them just know you are dealing with roses that have a long lineage. These are two roses that you can sit back and enjoy, while twiddling your thumbs.